The Honda Civic is in a class ahead of its compact car competitors, most of which are cheap to make and cheap to buy. The Civic, though, is a grown-up’s car priced so even a graduate student can afford one. From its sharp design to its refined powertrain to its fun handling, it aspires to be more than merely A-to-B transportation, and largely succeeds. Split personality. I don’t expect compact cars to be genuinely fun to drive, so it’s pleasantly surprising the Civic is. The balance Honda has struck between a comfortable ride and engaging handling is ideal and feels almost German compared to the basic driving dynamics of a compact competitor like the Toyota Corolla. A grandma could be as comfortable driving the Civic as her grandson would be impressed by its handling. Powertrain plus. 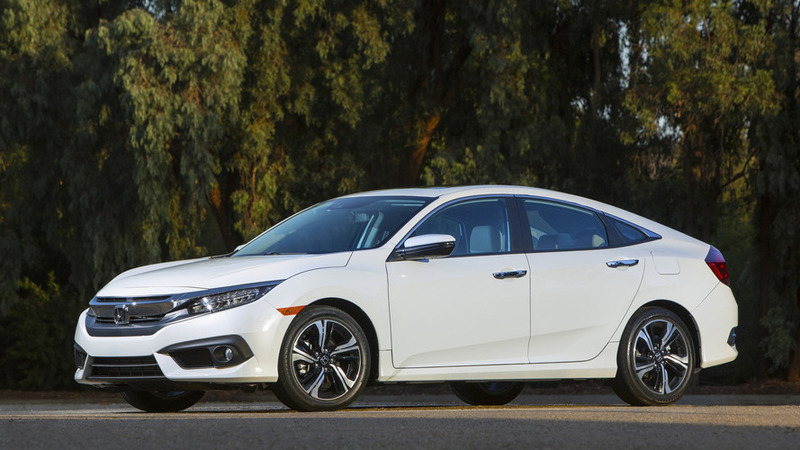 The Honda Civic I tested was a top trim level Touring model that comes with an optional turbocharged, 1.5-liter inline-four-cylinder engine producing 174 horsepower and 162 pound-feet of torque, mated to a continuously variable transmission. What, a CVT in the Pro column? 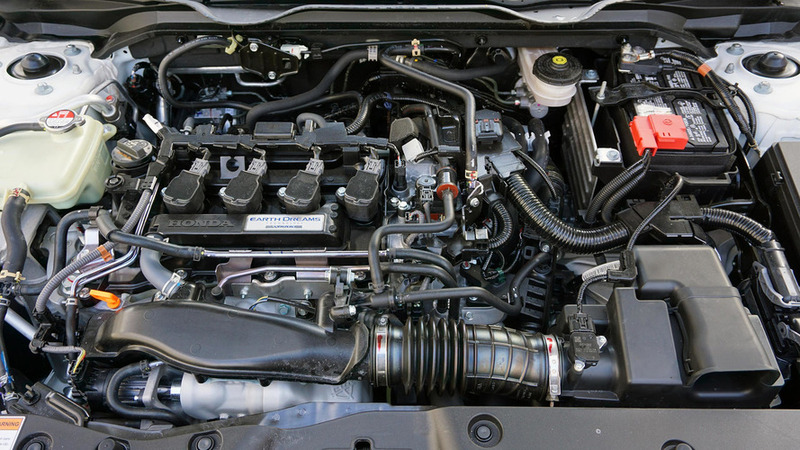 Honda did a great job creating a powertrain from these two components that’s powerful, refined, and efficient, more so in each case than nearly every competitor. The engine produces little vibration and sounds like it’s three cars away, while the CVT barely makes its presence known. It’s quiet, unobtrusive, and results in real benefits at the pump. Impressive MPG. The Civic’s fuel economy ratings are superlative, besting even specially equipped “eco” models from other brands like the Hyundai Elantra Eco and Toyota Corolla LE Eco. And even though this tester has the more powerful of two engines offered, the other being a naturally aspirated 2.0-liter producing 158 hp you get in the first two trim levels, it winds up returning even better fuel economy. Despite generating 174 hp (16 more than the 2.0-liter), the turbo 1.5-liter is rated at 36 miles per gallon combined versus 32 for the less powerful engine. Even that special “eco” edition Elantra and Corolla manage only 35 and 34 mpg, respectively. Let it stretch its legs on the highway, and the Civic will even take you beyond 40 mpg. Daring design. For me, Honda has been inconsistent with its recent designs, including other versions of the Civic; some have been hits and some have been misses. 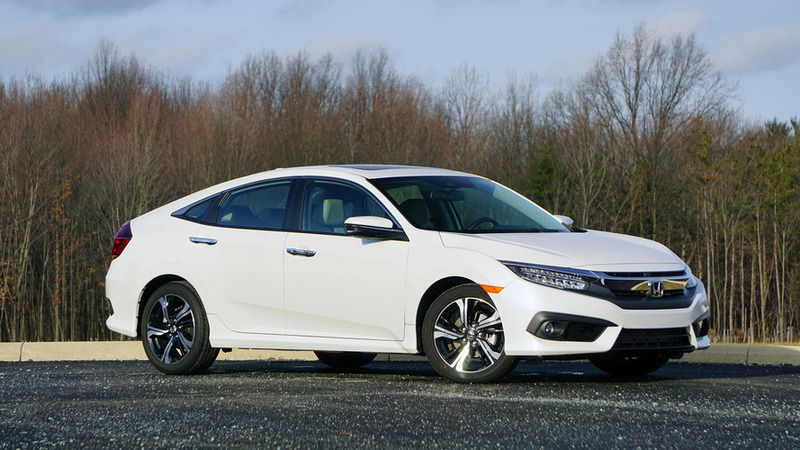 The Civic sedan’s shape, however, reminds me of elegant four-door coupes like the Audi A7 and Volkswagen CC – another signal that the Civic really has grown up. Infotainment trouble. 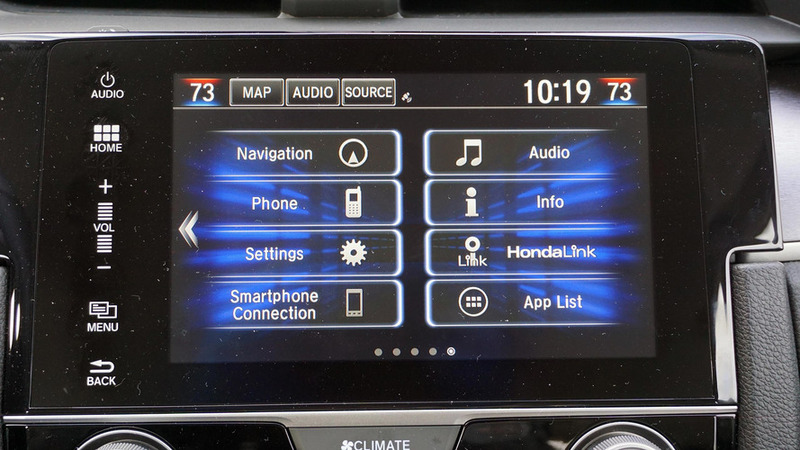 Honda’s infotainment systems are a problem throughout its entire lineup. Despite how great the Civic is otherwise, it’s no exception in this area. The system’s graphics look no better than a $100 portable navigation system you’d get at Best Buy, its menu structure adds extra steps to every function, and the worst sin of all: there’s no physical volume button. The touch-sensitive volume slider next to the seven-inch screen on the center console is perhaps the most infuriating input mechanism I’ve ever used in a car; forget about it completely and use the physical controls on the steering wheel. At least you get Apple CarPlay and Android Auto. Too low to go. The hip point on the Civic is very low, meaning you sit closer to the ground. This makes entering and exiting the Civic more challenging, especially for older people, for whom dropping into a car and climbing out of one can be both difficult and dangerous. While many other compact cars have grown in height and raised their hip points over the years, the Civic stubbornly stays low. The current generation is actually lower in height than the last one, and compared to top-selling compact cars like the Toyota Corolla, Nissan Sentra, and Ford Focus, its height of 55.7 inches is lower by at least 2 inches. Rear headroom. I love the Civic’s design from the outside, but its four-door-coupe shape compromises space on the inside, particularly rear headroom. 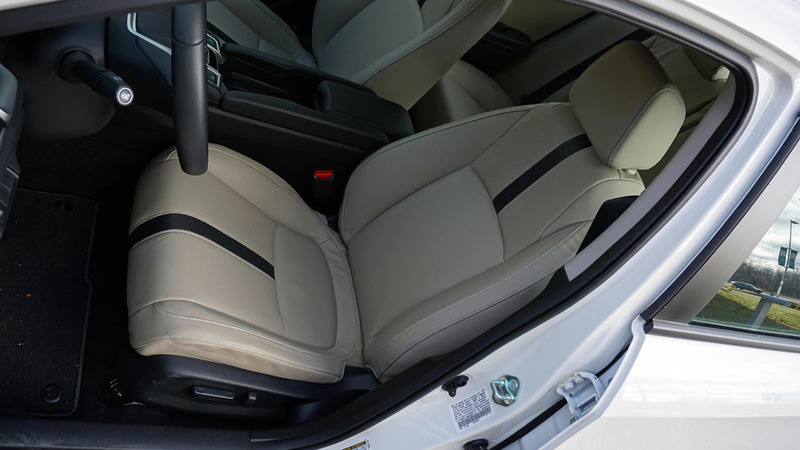 In order to fit normal-sized humans back there, Honda placed the seat cushions low and canted them back while also carving space out of the roof for heads to fit. Even then, at five-feet, nine-inches, I still manage to graze the ceiling.